I think that the Scottish city of Dundee is an ideal short break destination, so here are some suggestions for Dundee hotels. Dundee is located on the east coast of Scotland, on the Tay Estuary. There are some great Dundee attractions such as Discovery Point, Sensation Science Centre and the Verdant Works. Dundee also has a good selection of shops, cafes, bars and restaurants. There’s a lovely beach in the suburb of Broughty Ferry. My tips for the best places to stay in Dundee are based on my own experience plus research into Dundee hotels which receive very good reviews from guests. Premier Inn Dundee Centre is right on the Tay Estuary, so try to get a room at the back of the hotel for the views. The rooms are slightly dated but it’ s a good Dundee budget hotel. If you manage to get one of the Â£29 rooms it’s a bargain for the location. It’s just across from Dundee railway station, so ideal if you come by train. You can read my review with a video of the room in which I stayed in August 2010. The 4 star Apex Hotel is on City Quay, I’ve seen room only rates here from around Â£65 a night. The rooms get very good guest reviews but there are some negative comments about the restaurant, especially for evening meals. However, there are a couple of restaurants on City Quay and a good choice in the city centre, a 10 minute walk away. The hotel has a free car park, a health spa and free wifi. 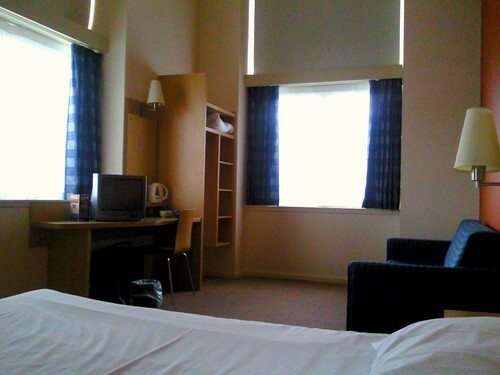 Another budget Dundee hotel option is the Travelodge Dundee Centre where I stayed in May 2010 for only Â£12 for the night. This was booked during the Travelodge January 2010 sale. The building was formerly a jute mill, so I had an enormous room with 3 big windows. There’s a free car park at the rear. I found the hotel to be a bit noisy as there’s a busy road at the front and service access to a supermarket at the rear. However, I do live in a quiet location and often find city centres noisy. You can read my full review which has a video of my room. 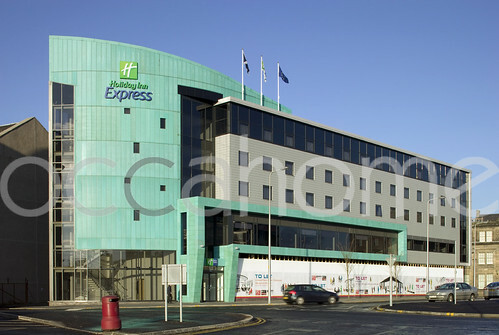 The Holiday Inn Express Dundee opened recently. The cheapest rooms I’ve seen on offer for this hotel were around Â£60. Continental breakfast is included in the room rate and there’s free wifi in the lobby. If you’re looking for accommodation away from the city centre, the Taychreggan Hotel in Broughty Ferry is a good choice. This Victorian mansion has ten rooms, some with views over the Tay estuary. There’s a garden with a sun terrace. This entry was posted in Accommodation, Scotland, UK and tagged Dundee on August 13, 2010 by Karen Bryan.